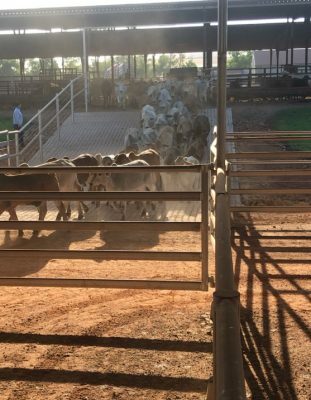 The Berrimah Export Yards has received its first intake of cattle following a $5 million upgrade, giving a timely boost to pre-export quarantine capacity in Darwin as monthly cattle export volumes nudge back toward a three year high. The Northern Territory Minister for Primary Industries Ken Vowles was on hand yesterday to see the first cattle run through newly upgraded facility, which is owned by the Northern Territory Livestock Exporters Association. The $5 million upgrade, funded by the NT Government, includes two new Entegra Ridgeback sheds with a carrying capacity of around 4000 head. 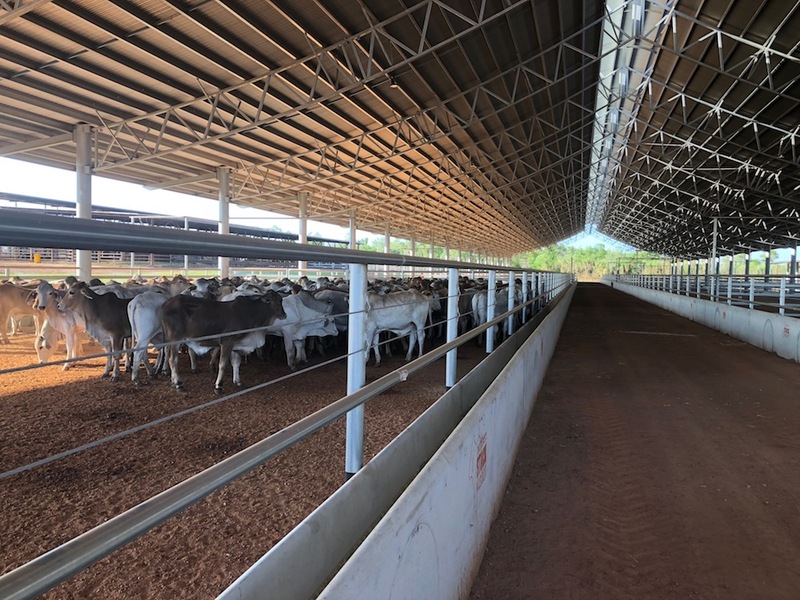 The sheds are designed to facilitate optimum airflow to decrease heat and humidity and keep cattle cool and calm during hotter months and sheltered from wet season rain. The facility is the closest pre-export quarantine centre to the Darwin export port, allowing exporters to load rested, fed and watered cattle quickly onto ships. However, the aging facility had been in drastic need of improvement, NTLEA chair David Warriner said, with the previous infrastructure making it difficult to handle cattle in wet season conditions. “What we have now is world leading infrastructure right here in the Territory,” he said. He said several export yards operating in the territory supply the market with best practice animal management and handling. However, during the peaks in the season, accessing sufficient capacity can be an issue for exporters shipping from Darwin. “Getting cattle to port that have been rested and are in optimum condition for export is a matter of having a number of facilities available, each able to cater to the needs of the exporters and their cattle,” he said. Mr Warriner said the Berrimah yards upgrade had been an ongoing project that had been supported by both sides of Government. “Without their assistance and commitment to the project, the redevelopment wouldn’t have been possible. The facility’s reopening has come in time to provide additional pre-export quarantine capacity for exporters at the busiest time of the export year. Figures released this week show that monthly cattle exports from Darwin reached 46,017 head in July, up from 41,205 in June. Last year monthly exports peaked at 45,138 head in June 2017. The July 2018 figure is the highest monthly export volume from Darwin since June 2015, when 69,319 head were shipped from the port. The export feeder steer price in Darwin is currently sitting around the 300c/kg range, having bounced back up from a year low of 265c in early June. Renewed demand from Indonesian lot feeders following stronger than expected Ramadan sales has led to increased shipping activity from northern Australia in recent months. The additional buying activity created by the return of the 20,000 head Wellard vessel the Ocean Drover to the northern Australia to South East Asia trade in June has also contributed to upward pressure on prices. The Drover loaded 19,000 cattle in Townsville last week and is currently enroute to Jakarta.“We’ve seen strong numbers out of Darwin this year. Mr Warriner said there has been some talk of cattle shortening up towards the end of the year but, as always, it would depend on the wet and what happens with rain in the north and further down south. “With numbers up 43 percent on this time last year there’s a lot of good news at the moment not just for the NTLEA and its members, but the northern trade in general,” Mr Warriner said. How many Solar panels are on the roof??? looks like they’ve modelled it on the sheds in Indonesia.. which are built for serious wet seasons.. good to see the Aussies learning from the Indos!